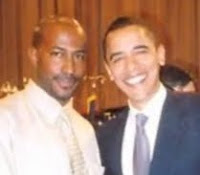 Van Jones on Wisconsin - "It is Time to Draw a Line in the Sand"
Long time communist activist and former Obama "Green Jobs Czar " Van Jones has issued a call to support protesting government workers and their socialist puppet masters in Wisconsin. In the past 24 months, those of us who longed for positive change have gone from hope to heartbreak. But hope is returning to America -- at last -- thanks largely to the courageous stand of the heroes and heroines of Wisconsin. Over the next hours and days, all who love this country need to do everything possible to spread the "spirit of Madison" to all 50 states. This does not mean we need to occupy 50 state capitol buildings; things elsewhere are not yet that dire. But this weekend, the best of America should rally on the steps of every statehouse in the union. On Saturday, the powers-that-be (in both parties) should see a rainbow force coming together: organized workers, business leaders, veterans, students and youth, faith leaders, civil rights fighters, women's rights champions, immigrant rights defenders, LGBTQ stalwarts, environmentalists, academics, artists, celebrities, community activists, elected officials and more -- all standing up for what's right. It is time to draw a line in the sand -- nationally. Someone has to stand up for common sense and fairness. It is time to use all nonviolent means to defend the American people and our American principles from these abuses. If we take a bold and courageous stand, over time, we can win. Make no mistake about it: this is our "Tea Party" moment -- in a positive sense. In fact, we can learn many important lessons from the recent achievements of the libertarian, populist right. Don't forget: even after the Republican's epic electoral defeat in 2008, a right-wing uprising was still able to smash public support for "new New Deal" economics. Along the way, it revived the political fortunes of the GOP. Let Saturday, February 26, 2011, mark the beginning of the national movement to renew the American Dream and return us to the moral center -- where everybody counts, and everybody matters. This is the "pressure from below" that Jones has long called for . The left understands that this "do or die." If they do not stand now, their movement will crumble and Barack Obama will lose in 2012. That is why every patriotic American should be backing Wisconsin Governor Walker in his stand against union blackmail. This is a vital showdown - the left must be defeated, or all of our freedoms are in peril. I am so grateful for all you do. It's time to draw a line in the sand and shoot every communist pos that crosses it. Only Beck has distinguished public unions from private unions- even O'Reilly doesn't know the difference. Thank you for clairity Mr. Beck. This issue is not about busting unions, it is about stopping and dismantling communism. Organized labor (unions) IS communism - "workers of the world - unite"; dictatorship of the proletariet"; etc. The labor union movement in this country was started by the American Communist Party, which spawned the modern DFL. The bottom line is whether we will allow communism to take over our country. That is the only thing that matters. Thank you so very much for all you do...your work is so valuable to those of us who care what happens to America! To the first "Anonymous" poster: Shooting is what leftist goons do. We conservatives do not resort to violence. Our guns are to be used in self-defense only. Jan. 14, 2010: Librarian, Michelle, says I must relinquish my place at the computer to a man that came in after my card was reset and I was at the computer. Ms. Diane Eddy the director gets within inches of my face while at the station and repeatedly demands and requests me to give up the session, and Ray, Star Security Guard, calls the sheriffs to have me removed from the library, after Ms. Eddy says I am causing a disturbance. Ms. Eddy uses the term "as a courtesy to me" when repeatedly demanding and requesting that I relinquish the seat. Aug. 7, 2010: My MP3 player is stolen at the library. Officer Roden makes it 'Lost Property'. July 21, 2010: A bag containing police reports made by me are stolen at the library. June28, 2010: My bag stolen at the Ala Wai. July 16, 2009: My tax transcripts are stolen at the State Library. These included a set that was sent to me unsealed. There are discrepancies in my name, address, wages reported, and withholding. Jun. 24 - Today, I go to the police station and inquire about these two reports (199784 152479). I find that there is no statement filed for either. One is for the bag, which did not contain the two recorders and two tapes when I claimed it. I also find Off. Lee left of one recorder and the tapes from his report. Also, the report number now jibes with the number in evidence, as it did not when I claimed the bag.